The seaworthiness of a vessel, in broad terms, is the ability of the vessel to provide safety, and comfort for her crew in all weather conditions. The concept of seaworthiness should not only be considered in storm survival conditions, because vessels can be lost in moderate conditions a well as in storms. The effects of fatigue in construction materials and rigging could result in failure in moderate winds, and crew fatigue due to extreme motion could result in errors of judgment, or exhaustion, long before a dangerous situation need otherwise have developed. Collision for instance can occur at any time, and accounts for the loss of a significant number of yachts, and in my opinion is a bigger danger than storm . Novanet Elite in storm conditions. 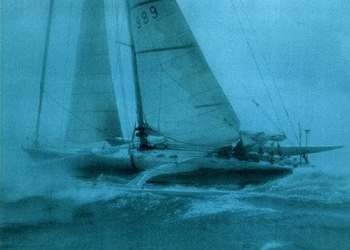 The John Shuttleworth designed 80 ft. racing catamaran "Novanet Elite" in storm conditions off Plymouth at the start of the AZAB race on the 6th of June 1987. The curvature of the 27 ft whip aerial on the stern gives some indication of the wind strength. There are four slab reefs in the mainsail and a storm jib has been set on an inner forestay. Note the height of the clew of the jib - to keep the sail clear of waves breaking over the boat. Skipper Peter Phillips said boat speed was 15 to 20 knots at the time. In this chapter I shall explain some of the many factors that affect the seaworthiness of multihulls. Including windward ability, stability, motion in waves, and pitching and rolling. I will describe the broad outlines of a number of distinct types of multihull that have emerged over the past 30 years, and go on to indicate how these different types of multihull can be handled in heavy weather, and then describe how a multihull can be made safe if the worst happens and the vessel capsises. The most informative technical work on seaworthiness in modern yachts to date is Seaworthiness the Forgotten Factor by C.A. Marchaj.1 Unfortunately the book concentrates almost exclusively on monohull design and very little is mentioned about multihulls. Since space is limited, I will not redefine the formulae and criteria for seaworthiness, which are explained clearly in the book, instead I will just go straight on to show how a multihull fits into the picture. On reading through Seaworthiness the Forgotten Factor, I could not help constantly thinking how few of the vices and problems, attributed to monohulls, were applicable to modern multihulls. Ocean going multihulls have been designed and built for at least 2000 years. And it is now an accepted fact that the Pacific was colonised from the West (i.e. to windward) by early navigators in outrigger canoes. These vessels were different from the general types of multihull that are being developed today, in that they had a main hull for the living quarters and stores, and a stabilising outrigger (or ama) which was always to windward while sailing. The mast was stepped on the main hull, and the vessel was 'shunted' end for end during a tack. This requires that there is a rudder at each end of the vessel, the hulls are symmetrical, and the sails can be set from either end. Making long ocean voyages aboard these craft required great skill and experience, and a high degree of 'toughness', since for the most part the accommodation was on deck, exposed to the elements, and weight carrying capacity was relatively limited. Modern yachtsmen in general require more creature comforts than the hardy navigators of the Pacific, and while some will accept spartan living as a necessary part of the adventure of going to sea, there are others to whom a fully equipped laundry, huge freezers, scuba equipment, speed boat, jaccuzzi, and dog kennel, are minimum requirements for simple living afloat. Therefore although the basic form of the multihull is derived from the polynesian vessels, we have had to develop a new form that can carry weight without loss of seaworthiness, and requires less skill to sail, since the modern sailor does not have a 'navigator' aboard who was born to the task with several generations of knowkedge behind him. Weight carying capacity. payload, safety. Thus over the past 30 years a number of distinct types of multihull have emerged all having different sailing qualities, and seaworthiness. There has been a steady improvement in the understanding of the factors required to make a multihull both safe and fast, resulting in boats that are extremely seaworthy, as will be demonstrated in the following pages. Travacrest Seaway in a Squall. Well reefed down. The basic types of Multihull are as follows. Obviously these are the extremes, and many boats will fall between the categories. The groupings given here represent a chronological order in only a very general way. Boats having some of the characteristics of the most modern types can be found in multihulls whose designs date back over 1000 years. On the other hand boats of all types are still being designed and built. From a subjective point of view, the order given here follows my own muiltihull sailing and design experience closely. I first sailed across the Atlantic some 17 years ago in type 1, later I crossed again in a type 2, and a few years ago in a type 3. Recently most of my long distance ocean voyaging has been aboard a type 6 catamaran. So the order given is more applicable to my own rather than general criteria, even though most observers of the development of the modern multihull will agree with the broad outline of each type. A keel in the sense used below is a foil for resisting leeway. The keel is not balasted as in a monohull, and may be fixed, or retractable either vertically (daggerboard) or by pivoting (centerboard). A few multihulls have been built with ballasted keels, but current practice is to make the boats wider to increase stability, and to keep weight low, to improve windward performance. Amas are the outer hulls of a trimaran, sometimes referred to as outriggers, or the smaller hull of a proa. Type 1. Early trimaran. Relatively heavy. High Windage. Inefficient underwater and keel shape, often with either a fixed keel or no keel at all. Small sail area. Hard chine with high wetted surface. Poor pitching control. Medium buoyancy amas (around110% of the displacement of the boat). Amas usually both in the water at the same time. Narrow beam (length to beam ratio = 2). Construction sometimes doubtful often in sheet plywood. Low long term fatigue. Type 2. Trimaran. Becoming lighter. Larger sail plans. Less accommodation. Low buoyancy amas (75 to 90%). Wide beam (L/B = 1.3). Considerably reduced windage. Improvement in structural design. Type 3. Trimaran. Light weight (due to the use of composite materials). Large Sail areas. Wide beam (L/B < 1.5 to as low as 1.0 in smaller boats.). High buoyancy amas (up to 200% of displacement). Pitching very well controlled by use of different hull shapes on main hull and ama. Sailing attitude well controlled on all points of sail. Low windage. Dramatic improvement in structures due to use of Computer aided design, and better understanding of composite materials. Type 4. Early catamaran. Relatively heavy. Narrow beam (L/B often over 2). Small sail area. Inefficient underwater shape with low aspect fixed keels or no keels at all. Cruising cats very heavy by today's standards. Bridgedeck saloon versions with large flat windows in coachroof causing high windage. Often prone to hobbyhorsing and pitching due to rocker and symmetry of hulls. Type 5. Catamaran. Open bridgedeck designs. All accommodation in the hulls. Greatly reduced windage. Keel shapes improved. Retractable daggerboards. Large sterns and fine bows causing bow burying tendencies on a reach. Greatly improved windward performance. Pitching control still poor, some attempts to reduce pitching by using bulb bows. Wider than early designs. Larger sail plans. Type 6. Catamaran. Open bridgedeck designs with large accommodation in hulls. Hobbyhorsing eliminated by hull shape. Windage greatly reduced by rounding and streamlining deck edges. Powerful efficient rigs. Sophisticated retractable daggerboards and rudders. Minimum wetted surface hulls. Excellent windward performance. Fast easy motion through sea. Very stable with wide beam (L/B < 1.5). Similar structural design improvements taking place as for trimarans. Type 7. Catamaran. Basically as 6 above but with very streamlined bridgedeck cabin for large accommodation and low windage. Light weight maintained, with large weight carrying ability for fast cruising. 8. Other types. Proas (Atlantic, ama to leeward, and Pacific, ama to windward) and trimaran foilers. In general these are development types almost exclusively for racing, as far as modern multihulls are concerned, and they have special problems that require particular knowledge, experience and seamanship for handling in heavy weather. Due to lack of space these types will not be dealt with in any detail in this chapter. Although I am concentrating primarily on cruising designs, many of the design concepts have been derived from successful racing designs. Indeed the racing designs which push the limits of performance to the edge, are an excellent test bed for cruising boats, particularly racers designed for the long offshore events like the OSTAR and the 2STAR, which are both predominantly to windward across the North Atlantic. In these races, ease of handling and motion, windward ability, structural integrity, and seaworthiness are of paramount importance. 1. Rolling. With the exception of type 2 above, multihulls are virtually immune to rolling. This means that the boat sits on the water like a raft - following the surface of the sea, giving great crew comfort while sailing, particulartly down wind. When lying ahull, cats and tris exhibit different characteristics. Firstly catamarans have a very high roll moment of inertia ( Ir ), because the weight of the boat is primarily concentrated at the hull centerlines. The buoyancy of the boat is also concentrated at the extremity of the hull centerline beam, giving massive roll damping. Open bridgedeck cruising cats benefit most from this effect, and low buoyancy ama trimarans (Type 2) least. In a tri the weight is concentrated closer to the center of gravity (CG), reducing Ir , and the amas take longer to pick up buoyancy as the boat heels, thereby reducing damping. In a low buoyancy ama tri this effect can lead to capsize in waves, (when lying ahull) as will be shown later, and different techniques of seamanship are required to ensure the safety of this type of multihull in a storm. 2.Pitching and hobbyhorsing. Many early multihulls were prone to hobbyhorsing, and pitching. This was caused by too much rocker on the hull profile, and fine V sections both fore and aft. U shaped sections forward help to reduce pitching, however too flat a forefoot will slam. As hull shapes improved tending towards more U shaped underbodies particularly aft, pitching still remained a problem, because the large width of the stern sections caused the sea to lift the sterns as the boat passed over the wave, driving the bow down. However we now know that pitching can be dramatically reduced by finer sections at the stern combined with the center of buoyancy being moved forward in the immersed hull, and aft in the lifting hull (ref 2 and 3). This effect can be achieved in both cats and tris, giving a very comfortable and easy motion upwind. At the same time windward performance is improved, because the apparent wind direction is more stable across the sails. 3 Yawing. Any tendency to yaw has been virtually eliminated in the modern multihull due to the shallow draft of the hull (because of the U shaped sections and the light weight), and by the use of retractable daggerboards. Once the keel is removed when sailing downwind, there is virtually no chance of broaching, as long as the forefoot does not dig in. This can be prevented by firstly reducing the forefoot, and by picking up buoyancy quickly in the forward sections of the boat above the waterline. Computer simulations of the hull in different bow down trims, and at varying waterline positions, are now an essential part of the design process to control sailing attitude properly, both on and off the wind. see Fig 1. (ref 4). 4. Surfing. A modern multihull will surf very easily, making for fast passage making in the open ocean. Sailing downwind in winds up to 40 knots can sometimes be quite comfortable and easy depending on the steepness of the seas. The apparent wind being reduced by the high boat speed. Once the wind speed becomes so strong, or the seas so steep, that surfing downwind is dangerous, and if the boat will not make progress to windward or lie ahull, (this could well be the case for types 1,2,and 4) It will be essential to deploy a sea anchor to control the boat speed. Much has been written on this subject, and certainly is an accepted way of surviving a severe storm in a multihull. From the designer's point of view it is essential to provide adequately strong attachment points on the bows and sterns. One of the main problems when sailing at 20 knots or over in the open sea, (even if this is just caused by surfing on the odd occasion), is that the boat will overtake the wave train, which is usually moving at around 18 knots. When this happens there is a danger that the bows could bury into the back of the wave ahead. If the true windspeed is say 35 knots and the boat is sailing at 16 to 20 knots as she surfs down the wave fronts. The apparent wind speed will be between 35 - 16 = 19 and 35 - 20 = 15 knots. So the "feel on the boat will be that you are sailing in a force 4. The danger here is that you may think you can carry full sail, and indeed you can, until the boat buries the bow and slows right down. Suddenly the wind across the deck will increase to nearly 35 knots, and the boat will be massively overcanvassed. At this point a jib sheet can be released, which may be enough to save the boat from capsise, but a mainsail cannot be depowered in the same way when you are sailing downwind. Therefore it is very important to be familiar with the static stability of the boat, and when sailing downwind ensure that you never have more sail area up than if you were sailing with that true wind from abeam. The bows can also be prevented from burying if there is adequate reserve buoyancy forward. This can be achieved by flaring the hull above the waterline, and by rounding the decks so that if the bow goes under, the build up of water pressure on the deck is reduced. The stern or transom should not be large, to prevent a following wave from lifting the aft end, thereby increasing the possibility of pitchpoling. Particular attention has to be paid to rudder size and design to maintain good control at surfing speeds that may be in excess of 20 knots. Elliptical balanced spade rudders of airfoil section reduce helm loads and drag at high speeds. Rudder stocks have to be very strong to be able to steer consistently at such high speed. 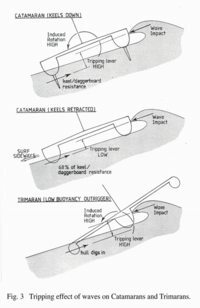 I used to favour using stainless steel or titanium, rather than carbon for rudder stocks, because at least the rudder will bend if overloaded (by grounding or hitting and object, instead of shearing off. However recently we have designed carbon rudders for some catamarans, because we have found that a bent rudder stock can jam in position, and cause more problems than if it had simply sheared off. It is important to design the rudders large enough so that the boat will steer with one rudder only. A couple of years ago I made a voyage from Corunna to the Canaries in a 42ft Cat with only one rudder, in wind speeds of 30 to 40 knots, without any problem. The factor of safety for the rudder design should be at least1.5 with rudder at 90 degrees to the waterflow at 25 knots. This situation is quite possible if the boat starts to broach and slew down a wave, and the helm is turned to full lock (35 degrees). A quick sketch will show you that the rudder is then presented at 90 degrees to the water flow. 5. Swaying. Fig 2 shows the righing moment of a Catamaran and a Trimaran of similar displacement. A modern light displacement multihull lying sideways to the seas with no sails up (i.e. lying ahull), and with the daggerboards up, will surf sideways very easily in a breaking crest. It will be demonstrated later that this is a very important feature in the seaworthiness of multihulls lying ahull in a storm. Multihulls with fixed keels and tris of type 2, have the possibility of tripping over their keels or amas when struck by a breaking crest. Narrow beam increases the danger of capsize in this situation. In a recent tank test programme we dragged a 65ft cat sideways with no keels, two shallow keels, and two deep keels. The increase in sideways resistance, at 3.4 knots was : no keels	100% Shallow keels	123% Deep keels	132% Although we did not test a daggerboard, I would estimate that a daggerboard on the downwind hull would be in the order of 145% to 150%. Fig 3 shows the effect of the tripping action of a board or low buoyancy outrigger that has become immersed. If sideways motion of the yacht needs to be stopped, for instance because of a danger to leeward, this can be done by either deploying a sea anchor abeam, or by putting down the upwind board. (this only applies to a cat) The upwind board can act as a brake without imparting rotational momentum to the boat. If the boat does not rotate - it will not capsize. 6. Heaving.This is a complex problem to define clearly for a multihull, because the two immersed hulls are at different places on the wave front at any given time. Nevertheless, they heave less than monohulls because the hulls are slimmer, allowing the yacht to cut through the water when sailing. Loss of apparent displacement at the wave crest and rotational momentum imparted to the boat by heaving on the upwind hull will assist in capsizing an overcanvassed multihull due to wind and wave action. Heaving assisted capsize has been experienced particularly in tris of type 2, and cats of type 4. This is of particular importance and will be dealt with more fully in the next section. This is generally a very contentious and little understood subject when multihull seaworthiness is discussed, and is probably the biggest fear that inexperienced sailors have about this type of vessel. And while it is true that certain multihulls have capsized, it is clear from the above that there are many different types of multihull, and indeed there are different ways in which they can capsize. I will endeavour to show that with a real understanding of the factors that contribute to capsize vulnerability, it is clear that some multihulls are extremely difficult to capsize, and therefore are very safe in all conditions provided that the correct amount of sail is carried in relation to the wind and the sea state, and when sail can no longer be carried, correct storm techniques are adopted. (Bearing in mind that there may be a wave out there that will overwhelm any vessel). Fig 4 shows the paramaters as they apply to a cat and a tri. This formula gives designers a measure of stability as an indication of the power to carry sail. i.e. the ability of the boat to resist capsize by wind action alone. This formula accounts for gust loading, the actual static stability is 40% higher. See Technical Q&A's for more information on why we reduce the stability factor in waves. There are two factors that can reduce SF. Firstly if the boat has a high angle of heel at the point of maximum stability, (worst in trimarans of type 2, and minimal in all catamarans) the correct SF is given by replacing beam in 1 with beam overall x cos(angle of heel). Typical values for SF can vary between 12 mph for a Formula 40 racing catamaran, to over 50 mph for cruising multihulls. Modern light cruiser racers would be in the range of 24 to 30 mph. So it is clear that in addition to the different types of multihull listed above the initial static stability can vary enormously. Stability curve and stability in waves. Righting moment is the distance from the center of buoyancy to the center of gravity x the apparent weight of the vessel. This is basically the vessel's inbuilt static resistance to heeling. The forces that heel the boat could come from the wind and/or the waves. Fig 2 shows the curve of righting moment versus angle of heel for a typical modern 35ft catamaran and trimaran racer cruiser to my design. The trimaran (Type 3 high buoyancy amas) has an overall beam of 32 ft. and the cat ( type 6 ) beam = 23ft. The trimaran has less accommodation, and is lighter than the cat, but because of the wider beam it has greater maximum stability. It is important to note that the maximum stability of the tri occurs at around 20 degrees angle of heel, while the cat has a max at about 6 degrees. If the buoyancy of the ama is reduced below 100 % of the weight of the boat (as in type 2 above), the maximum stability will be reduced not only in proportion to the reduction in buoyancy in the ama, but also by the effect of added apparent displacement from the downward pressure from the sails at high angles of heel. At 20 degrees this would cause a loss of righting moment in the order of 20%. If the ama buoyancy was only 80% in the first place, the total righting moment would be only 60% of an equivalent trimaran of type 3. Fig 6 shows the same righting moment curve for the cat versus a typical modern cruiser/racer monohull. The energy required to be input into the yacht in order to roll it from 0 degrees to the point of capsize (90 degrees in the cat and 135 degrees in the Mono) is given by the area under the curve. From the graph it is clear that the energy required to roll the cat over is 50% higher than the monohull. Of course in either case the initial angle of heel will reduce the available reserve of stability, and in the trimarans this reduction in energy resistance to roll will be greater than a cat. The energy to roll a tri to 90 degrees is much greater than a cat provided it is of type 1 or 3. However in all cases, in order to a capsise to occur, the energy from the wind and the waves (which is equal to the area under the righting moment curve) has to be transferred to the vessel in the form of rotational energy. In waves alone, if the energy of the wave impact is not changed into rolling energy the boat can not capsise. Firstly if we consider the action of the waves alone. Tank testing has shown (ref 1) that capsise due to the action of unbroken waves is impossible. Therefore when a vessel is lying ahull the impact of the breaking crest is the primary means of energy entering the system which may be transformed into roll energy. A multihull follows the slope of the wave face exactly like a raft as shown in fig. 7. However, because the buoyancy and the weight of the vessel is concentrated at the extremities of the beam (particularly in cats of type 6,) multihulls will be more stable against rolling than a simple raft. Most mopdern multihulls have low draft, and if the keels are retractd, or not too dep, virtually all the energy of the wave impact is absorbed by surfing sideways. This is exactly the same effect that saves the older type of monohull from capsising in waves, the only difference is that the monohull has to experience a knockdown before the keel is almost parallel to the surface of the water, thereby reducing the lever arm (r) and allowing the energy to be dissipated into sideways motion. The multihull that fares worst in this situation is the trimaran with low buoyancy amas. When a wave hits the side of the boat, firstly it will roll quicker and much more than a cat, and if the ama immerses to the point where it digs in, thereby stopping sideways movement, all the energy will be transferred into rolling and a capsise is possible. Also having deep fixed keels or leaving the downwind board down will greatly increase the risk of capsise in waves for all types of multihull. Another area of traditionally poor performance in multihulls is their windward ability. And indeed it is true that the older types of multihull (types 1 and 4) would tack through 100 degrees or more, and had very inferior pointing ability when compared to their monohull counterparts. Today however modern multihulls are designed paying careful attention to weight saving in the structure, aerodynamic drag of the hulls and superstructure, with efficient rigs and wide overall beam to give good sail carrying power. All these features combine together to give a windward performance better than any equivalent sized monohull. In a force 4 wind, a modern 60ft racing trimaran will sail upwind at 16 knots tacking through 75 degrees. While an open bridgedeck cruising cat like the Spectrum 42 will tack through 80 degrees, at around 10 knots. The implications of this sort of performance is also an indication that modern multihulls will sail upwind in a gale long after the monohulls have had to heave to. Indeed this superior windward ability has been conclusively demonstrated in all the windward races of the North Atlantic and is a factor of major significance in the improved seaworthiness of modern designs. Windward ability is a very important measure of seaworthiness, and can prove vital if there is a danger to leeward in a gale. We now have the ability to design a hull and decks for a complete multihull directly on a computer screen (ref 4). The computer allows us to rotate the hull and draw sections at any angle across the boat. We can therefore see the shapes that the wind is going to flow over in the exact direction that the wind strikes the boat. Remember that the wind never comes from dead ahead in a sailing boat. In fact the boat is really moving crabwise through the air, at best the wind crosses the boat at and angle of around 30 degrees from the bow. Fig 8 shows the perspective view on the computer screen of a bridgedeck cabin for a 43ft cat. It will be obvious that this is a very useful aid in achieving aerodynamically clean 3 dimensional shapes like this. And the next step will be to test the complete hull and bridgedeck in a wind tunnel. Total potential loss of windward ability due to Drag. Theoretical calculations of the aero, and hydrodynamic drag of various types of multihull shows the following effect of keel efficiency, weight, sail are, and aerodynamic drag. If we include the lift to drag factors of the sails.... 16% decrease in sail area = total loss in tacking angle of 4 degrees. 35% increase in aerodynamic parasitic drag = total loss in tacking angle of 6 degrees. When compared to a design of type 1 or 4 the modern multihull is much more streamlined, about half the weight, has an efficient keel, wide width for high stability and sail carrying power, and larger rig. Where the older designs tacked through 100 degrees, a modern design will be sailing considerably faster and tacking through 80 degrees or less. In order to achieve large volume in a cruising cat without increasing windage, the hull can be flared above the waterline. This flare can also be used to increase the reserve buoyancy forward, and to control the movement of the center of buoyancy as the boat heels. The same applies to the main hull of a trimaran. Safety in the event of collision or capsise. Even though it has become extremely unlikely that a properly designed multihull will capsise, the possibility still exists, in much the same way as it exists for any monohull. The monohull's escape valve is that there is a chance that the boat will right itself before it sinks. The multihull on the other hand can be made into a safe raft for the crew to live on in the inverted position, provided that proper provision for this eventuality has been made at the design stage. In terms of ultimate safety of the crew in the most extreme storm - I believe that a habitable inverted multihull offers better survival prospects than a partially flooded - dismasted monohull that has rolled through 360 degrees, and is in imminent danger of doing so again. The structural cross beams of a cat should be designed to be watertight, with their combined volume large enough to support the whole weight of the vessel. In the unlikely event of a capsise, this will ensure that the boat floats high out of the water, which reduces stress on the structure, and allows the crew to live in the upturned hull. Escape hatches should be incorporated in all designs as a matter of course. - Integrated structure. During the lifespan of a multihull it is subjected to many cycles of a complex array of loads, and if the boat is to survive in all conditions without damage careful attention has to be paid to avoiding stress concentrations in the structure, and to the long term fatigue of the materials used to build it. Fig 9 shows a generalised stress diagram for an open bridgedeck catamaran. By using a computer to analyze the loads at any point in the boat, and then laying appropriate amounts of fibers aligned in the direction of the stress, the stiffness and the strength of the boat can be greatly increased. While at the same time weight can be saved by removing excess material where it is not required. This weight saving actually increases the strength of the boat, because it not only reduces the loads that the boat experiences, but it reduces stress concentrations, which are a major cause of fatigue failure. If the structural design is carried out in this way, and adequate allowance is made in the fiber stress levels in the all parts of the boat to account for long term fatigue, the lifespan of the boat will be greatly increased. At present, research indicates that if a composite laminate can survive over 10 million cycles, it will last indefinitely. In general in order to achieve this, a factor of safety of at least 10 is required. In all my cruising designs I use at least 10 as a factor of safety in areas of maximum stress. For carbon in particular the laminate is strain limited because the material is so stiff, has a relatively low strain to failure, and an extremely high notch sensitivity. However the material can be very successfully used in areas where great stiffness is required, like the cross beams of a multihull. There are many racing and cruising multihulls sailing that have been designed in this way, and that have suffered no structural failure what so ever, in thousands of miles of hard ocean sailing. In the past 20 years the level of understanding of the factors that affect the seaworthiness of multihulls has increased enormously. I hope that the above discussion makes it clear that there are many different types of multihull, and that different techniques are required to handle thes different types of multihull in a storm. Indeed many of the problems and vices associated with the older designs have now been eliminated, and the new generation of cruising designs are very exciting boats to sail, while still offering vast accommodation, crew comfort, and most important of all - safety at sea.